There is nothing so effective in teaching valuable lessons of life like a good and true story. Many of Jesus’ greatest lessons began with the words, “A certain man (or king, or householder)”, which indicated that the story came from actual people and events. Since many have asked me to tell about the coin we distribute, with the words “Where will you spend eternity?” on one side, and the quote of John 3:16 on the other, I’ll take this opportunity to tell the story. From the beginning I ask that you keep in mind that no real-life story is complete in itself. The end of the story is the beginning of another story. Every story, like every life, sends out its ripple-effects that continue on long after the original has passed from the scene. So it is with the story of “Mr. Eternity” and the coin that now has spread around the world. My family and I had moved to Western Australia in 1996, where I was pastoring Cross Road Bible Church. In October of 1998, we were hosting our annual youth camp, and I invited Evangelist Gary Horton to come as a speaker. During his time with us he was handing out aluminum coins, about the size of a silver dollar, which read on one side, “America, land of the free only as long as it remains the home of the brave”, and on the other side the quote of John 3:16. The coin was a great hit with the kids, but I wanted to have something that the Aussies could take pride in too. Before leaving America for Australia, I had heard stories of a man who became known on the streets of Sydney as “Mr. 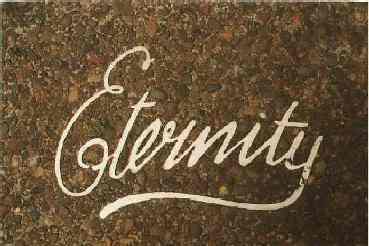 Eternity”, and as “The little white-haired man from Sydney”. Born in a slum in Balmain, Sydney, Arthur Stace was the son of parents who were both alcoholics. Arthur grew up sleeping under the house on old soiled bags, going out early in the morning to steal milk from doorsteps to satisfy his constant hunger. Like his two sisters and two brothers, Arthur grew up a petty criminal and a drunkard. His sisters grew up to run brothels, his brothers were in and out of jail, and all died in drunken stupors. All except Arthur, for whom God had an amazing story of grace planned. For years Arthur, who was first jailed at the age of 15, went from bad to worse. He moved from petty crime to working with gangs, and from beer to whiskey to methylated spirits. His despair in time led him to half-way houses and psychiatric clinics, until he was finally being considered as a candidate for Callan Park Mental Asylum. Then came the day that a dirty, ragged, man walked into St. Barnabas Church on August 6th, 1930. Here derelicts were given a cup of tea and a “rock cake”. A men’s meeting was being conducted by Archdeacon R.B.S. Hammond, and Arthur wandered in. He would later say, “I went in to get a cup of tea and a rockcake, but I met the Rock of Ages.” Here for the first time Arthur heard the Gospel of the death, burial, and resurrection of the Son of God for sinners. Leaving the meeting with the conviction that Jesus Christ had died for him, and was alive, Arthur found a secluded spot in a nearby park. Under an old fig tree the broken little man began to sob, “God, be merciful to me, a sinner.” His simple and humble prayer was heard, and Arthur was made a “new creature in Christ” (2 Co.5:17). Arthur began to rise early and read his Bible. This he followed with simple prayer for cleansing, and for strength from above to break the power of the evil one over his life. For the next 35 years, Arthur Stace walked the streets of Sydney, Australia – praying before dawn about where he should go – and wrote a one-word message, “Eternity”. As the word began to appear at bus stops, on sidewalks, before factories, all of Sydney began to question who this side-walk evangelist was. No one knew, until years later, when the pastor of his church saw him stoop to write the word outside the Burton Street Baptist Tabernacle. Not until then was “Mr. Eternity” identified. But for years Arthur had been holding impromptu street meetings, and meeting people on the street, he was known to ask, “Do you know where you sill spend eternity?” Only God knows how many came to faith in Jesus Christ through the obscure and unknown work of “the little white-haired man from Sydney”. Arthur Stace went home to eternity in 1965, but his legacy continues on in another story. Over the last few years, I have carried these coins to some far-flung corners of the world. We have been surprised to find on returning to some places years later, people carrying or wearing the coins around their neck. In some places, we have seen them turned into ear-rings! We have found that unlike a paper tract, they cannot be torn up or wadded into a ball. When you throw them down, they ring like any coin, and people are quick to run and pick them up. We once saw on the streets of Perth our daughter toss one from the second story balcony of a Coffee house, onto the mall below. A street band was playing, and one of the band picked up the coin. After reading both sides (I have never seen anyone only read one side) he placed the coin on his guitar case. Later, another member of the band saw it, picked it up, and after reading it, tossed it down the mall. It went ringing down the way, and immediately, someone picked it up, read it, and put it in their pocket. It is in this way, by an obscure and unknown ministry, that Burt Camenzind has become the “Mr. Eternity” of our times. To order the coins directly call Osborne Coinage (1-800-488-2646). Please pray for Burt, as he has financed this venture without any request for help. Believing (as we do) that “God’s will, done God’s way, never lacks God’s supply” (as Hudson Taylor said), he continues to supply the coins in the extravagant freeness of God’s grace. Pray for the coins that have now found their way into eighty languages, and even more foreign countries. For once confronted with the question, “Where will you spend eternity”, and having read the potential answer, “For God so loved the world that He gave His only begotten Son, that whoever believes in Him should not perish but have everlasting life”, each soul must make its own answer to God. May this simple coin bring multitudes to cry, like Arthur Stace, and the poor tax collector before him, “God, be merciful to me, a sinner!” (Luk.18:13).